OK, I thought there was a thread on these, but I can't find it. So maybe it was on the old board and didn't get ported over? Or maybe I put it on another forum (gasp)? What is a remarque? As a selvage collector, normally I shudder when I see any sort of writing or scribbling on the selvage. There's lots of space in the stamp margin, so why write on the precious selvage? Anyway -- I do make 2 exceptions: autographs and remarques. I don't collect either; too rich for my blood. However, I do like to collect pictures of remarques! So what's a remarque? 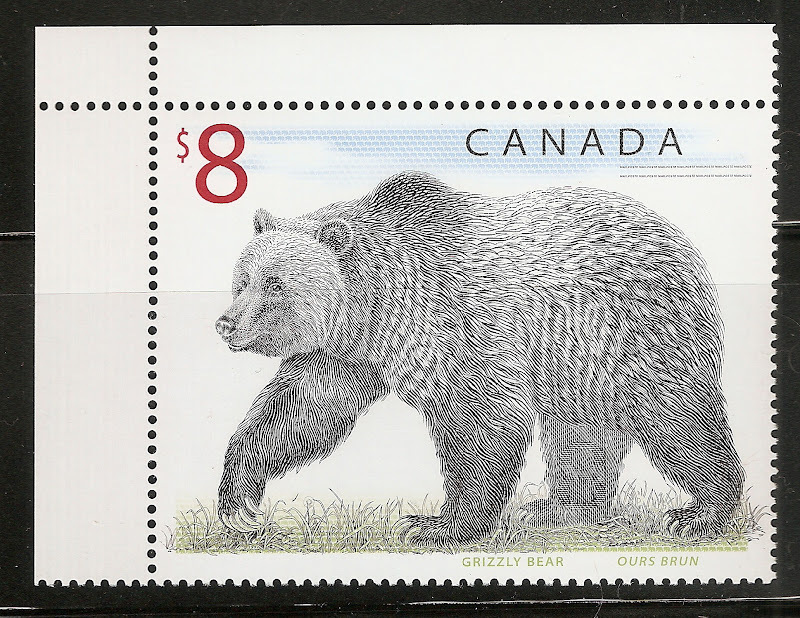 It's when an artist draws/paints an extension of the design of the stamp into the selvage, or they may even make a separate illustration on the selvage to complement the stamp design/topic. 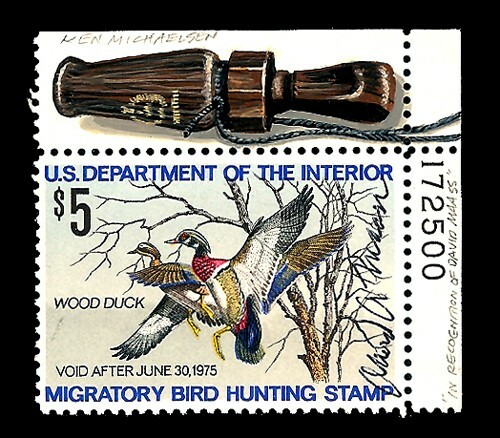 Here is a remarque of a US Hunting Permit Stamp (often called "Duck Stamps", for obvious reasons). Scott US #RW14(1946) showing snow geese. Original designed by Jack Murray. Scott US #RW41(1974) showing wood ducks. Original designed by David A. Maass. (Edit: in case anybody was wondering, that's a drawing of a duck call in the top selvage). Stay tuned for more tomorrow. 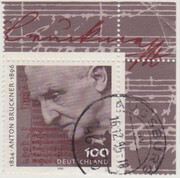 In the future, I'll also try to post a comparative image of the stamp without the remarque. Learned something new today. Thanks for sharing!!! I've been saving selvage, but didn't know about the fancy name. I believe these two would qualify. However, I should have clarified that remarques are hand-drawn by an artist AFTER the stamp has been produced. They are made one at a time, not mass produced. i have never heard of these until now.. what a remarkable (no pun intended) thing to see. i am eager to look at more of these..
on a side note (and i promise to not make mention of this again after) - perhaps a thread on interesting selvage would be a good idea! perhaps a thread on interesting selvage would be a good idea! Then I'll work on a selvage thread. However, if someone else wants to start a selvage thread, please feel free to do so -- don't wait for me. Remarque on left, original stamp on right. Sorry, I don't have a high-res of this remarque. 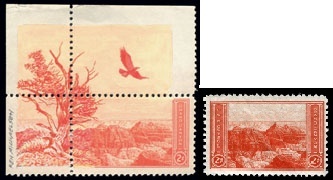 Scott US #741(24Jul1934) showing the Grand Canyon in Arizona. Notice how the artist has actually drawn over the left panel, to create the illusion of an extended picture. 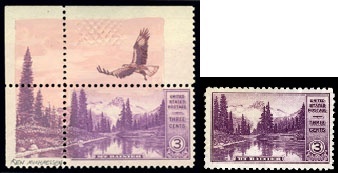 Scott US #742(3Aug1934) showing the Mount Ranier and Mirror Lake in Washington. Notice how the artist has color matched the remarque ink to the stamp color. Not a trivial task. It's not like you can take the stamp to Home Depot and have them mix the paint for you! I believe the artist Ken loved birds. Just an observation. 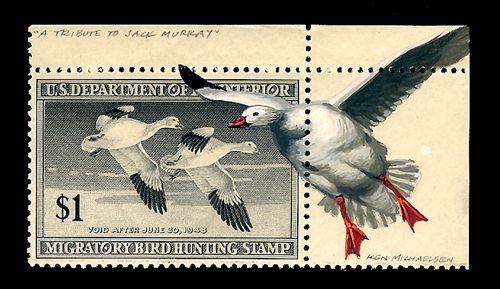 As far as I know, the bulk of his work is on Duck Stamps. But don't hold me to that, as I don't really follow his career. Most of the pics I have are remarques on Duck Stamps. 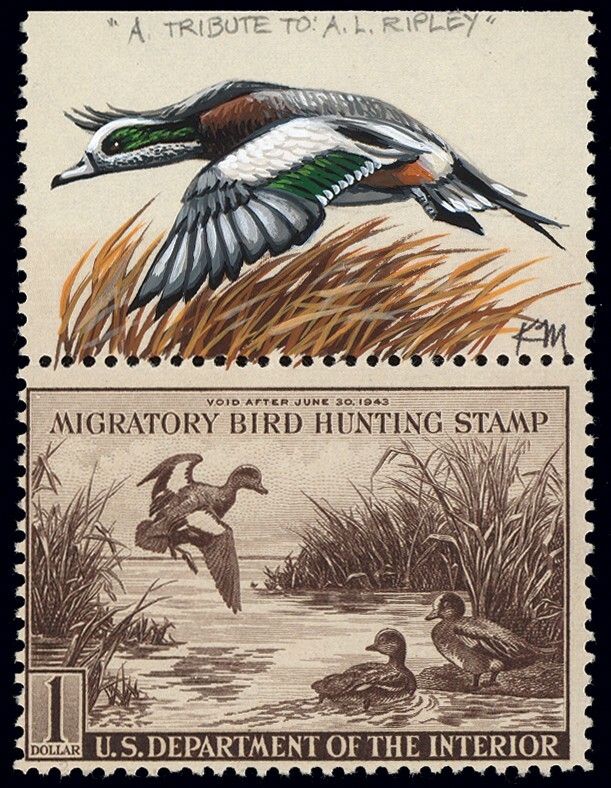 But those will be appear much later in this thread, as I acquired the pictures of the Duck Stamp remarques much later. I am posting the pics according to chronological order of downloading them. There will be a few other artists that will show up later; Ken is not the only one. Goal accomplished: I learned something today. Thanks!!!! Scott US #RW9(1942) showing baldpates. Original designed by A. Lassall Ripley.